Whether you are buying or building, or just love house design, welcome to my home. Step inside my little web-kitchen and enjoy some house talk with me. I’d offer you a cup of coffee, but this is a virtual world, so instead let me offer you a cup of house design conversation. Click on the links below to start learning more about houses and house design. When you find something you like, be sure to leave your comments, so we can continue our conversation. Uncertain what type of house you are looking at? Tired of not knowing one house style from another? Let me tell you a story. Years ago I was looking to buy my first house. One source I liked to peruse was a free monthly magazine showing all the local homes for sale. You know the type. You probably have one now. I was poor and just this side of broke, so everything in budget was small. And it seemed like everything I looked at was called a “Cape Cod”. But they didn’t look anything alike. As I suspected; you do know what I am talking about. Well, I got tired of not knowing what-was-what and having to take some real estate agent’s word for it so I did some research on house design. I put all this together in the section that I call House Styles, so that you can learn and enjoy. And by-the-way, they weren’t all Cape Cods. Very few, in fact. Georgian style houses were the American colonies first steps away from the vernacular styles and towards architect-defined styles. Here America started following the latest trends in house design back in England and the trend they started following was the Georgian. Andrea Palladio built country homes for the wealthy merchants of Venice in the 1500's. Two hundred years later he was to inspire grand homes in England and in America. Plantation homes of the South would have looked significantly different without his influence. The Federal style wasn't so much a reaction to the Georgian style, as a rethinking of that style. It caught on at about the time that the Constitution found life, and for a while was the style of the new republic. There are more similarities than differences between Georgian and Federal, so the two are often confused. Greek Revival style homes looked nothing like homes in Greece, but they did sometimes look a lot like Greek temples, and they captured the imagination of a young country that idealized the birthplace of democracy. The Gothic Revival led to several styles in America. The first fruits of that revival were the Carpenter Gothic homes. The gingerbread look that would characterize later Victorians made its first appearance on these early Gothic homes. The Queen Anne, and the Victorian Stick Styles are the houses we typically think of as "Victorian". With their turrets and shingles and gables highlighted with a colorful pallete they present a visually engaging image. Learn how to distinguish these houses and how they developed. The Italianate was America's take on the Italian Villa. There were true Italian Villa's built in America, but this was the Villa with a twist. Wide eaves, carved brackets, and low-pitched roofs were the hallmarks of this style. 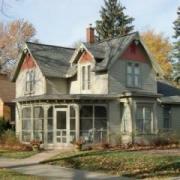 The Craftsman style of house design was all the rage in the early 20th century. It was America's answer to the Arts and Crafts movement as applied to Architecture. It blended craft with simplicity and honesty of materials. Mission Revival grew out of the Spanish/Mexican architecture that came north with the missionaries. Part Spanish Baroque and part puebla adobe the missions inspired Twentieth century homes throughout the Southwest. The Tudor style attempted a more authentic representation of Gothic era housing than was achieved in earlier Gothic Revival forms. The Art Deco replaced the flowing lines of Art Nouveau with sharp lines and basic shapes combined with experiments in new materials, like glass block. The Ranch also grew out of Mexican Architecture of the Southwest. In this case they copied the low-flung buildings of Mexican Ranches. In most cases the Ranch has lost its Mexican looks, but kept the low, sprawling layout of its hacienda forebears. Good house design involves more than just assembling the various parts of the house, but it is important to understand how the various parts contribute to the overall design. Getting the parts wrong can ruin the effect of the total design. This section looks at the various parts of the house. We consider design and function, how the parts contribute to the total look, but also how they contribute to make a home safe, solid and secure. This section will always be under construction as month-after-month we add new information. What you see now will change, so come back often. The roof is critical for preserving the house, but it also goes a long way toward establishing the character of a house. Shape, color and texture will all effect the impression your house leaves on people. Siding is the skin which give the house most of its texture and color. Sometimes it is also the layer that keeps the rain and wind out. It can be a structural element, supporting the house, but mostly it is just for show. The garage takes up a lot of real estate, but the biggest problem is the visual real estate it hogs. Too many houses look like an afterthought, thrown an after the architect finished with the garage. Here is my solution to this problem. Arches often form decorative elements in houses. Sometimes windows or doorways are arched. Supporting columns may support the ceiling via an arch. Why is this? The front porch is an American addition to home design. They were found in other countries, but only in America did it become standard fare for houses of all classes. The feature nearly died out in the twentieth century, but is making a strong come-back.